Think of 15 albums, CDs, LPs (if you’re over 40) that had such a profound effect on you they changed your life. Dug into your soul. Music that brought you to life when you heard it. Royally affected you, kicked you in the wasu, literally socked you in the gut, is what I mean. Then when you finish, tag 15 others, including me. Make sure you copy and paste this part so they know the drill. Get the idea now? Good. And if I say to you tomorrow, take my hand child, come with me – it’s to a castle I will take you. Well what’s to be they say will be. One of the first albums that I remember playing on an old record player in the living room. 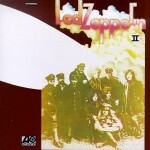 Led Zeppelin’s second offering from 1969 started to show that these guys knew a thing or two about rock, as well as started the lasting relationship between the band and Eddie Kramer as their recording engineer. The canonical “Whole Lotta Love” sound which everyone knows and loves was in part formed by Kramer and guitarist Jimmy Page bouncing around the studio and twisting every knob and dial they could find. When the sun beats down, and I lie on me bench, I can always hear them talk. Me? I’m just a lawnmower. You can tell me by the way I walk. I’ve got nicotine stains on my fingers, got a silver spoon on a chain, got a grand piano to prop up my mortal remains. The Wall holds a spot on this list for a couple reasons, not the least of which being it was my second CD purchased ever (at the same time as Led Zeppelin II above). I also remember hearing it play on 94 WYSP one evening, when they used to play entire albums from start to finish. Since I’d already used to play Zep II all the way through on vinyl, that makes The Wall the first CD that I’d play all the way through without skipping a song. There’s still quite a few albums in my collection that I don’t listen to every track, but this is one album that simply hearing a single song from it makes me long to hear the ones that follow. 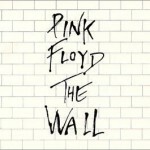 And if that song happens to be the last track, “Outside The Wall?” Well, isn’t this where we came in? Happy and I’m smiling, walk a mile to drink your water. You know I love to love you and above you there’s no other. To this day, whenever I hear songs such as “The Teacher” by Jethro Tull, I think of the video game Ultima VI. I happened to pick up this album around the same time I started playing that game, and quickly learned how to use the program feature of the CD player to set a specific track list and hit repeat. Since the music was just a background at that point, I didn’t notice how many times it would loop around to the beginning – but I still think of saying “spam spam spam humbug” to Iolo, and Living In The Past. The muses dance and sing, they make the children really ring. I spend the day your way, call it morning driving through the sound and in and out the valley. Fragile was another more recent acquisition. 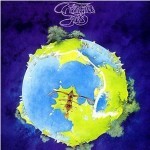 I already had most of the tracks that made up the album from other albums, such as Yesstory and Classic Yes. 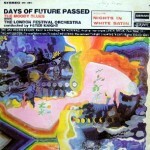 But hearing them together on the 1971 debut of Rick Wakeman’s keyboarding with Yes (their fourth album overall) just works so much better.. from the slam of the door at the beginning to “South Side of the Sky”, to “Mood For A Day”‘s lilting melody just before the more raucous “Heart of the Sunrise” (which ends with the aforementioned door opening again, on a room in the middle of the chorus in “We Have Heaven”), Fragile is definitely a good addition to the collection of any fan of Yes, progressive rock, or just plain good music. There is unrest in the forest, there is trouble with the trees for the maples want more sunlight and the oaks ignore their pleas. Talk about a happy accident. 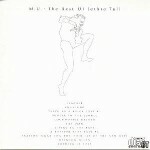 You’d think that looking at the album cover for “Exit… Stage Left” would clue one in that this is a live album. Maybe the fact that all of the tracks on there were tracks I liked? Nope, no idea when I brought it home. I was just finally happy to have had one CD with a lot of songs I enjoyed, instead of having to buy 5-6 CDs to get them all! Now, I’ve always considered myself a bit of a purist. I don’t mind hearing a band live, if I’m there. But if I’m buying a CD, I want to hear the same thing I hear on the radio. Well rehearsed, polished, tuned, a good quality recording of a song. Not something live, generally. So when I put this CD in and pushed play, and heard the crowd start to cheer, I was quite upset. I had just wasted my money, which I could’ve spent getting one of those five or so Rush albums to get started with my collection, on something with a live recording instead. And then I hear Geddy say, “This is the Spirit Of Radio…” And then I heard Alex play the opening riff. And I almost died on the spot. Now I’ve known some bands to put on wonderful shows, and sound great – but I almost couldn’t tell the difference between this recording and the studio cut, they’re that good! 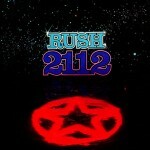 I listened to this CD quite a lot, until I eventually picked up various other Rush albums. And to this day, if I’m listening in the truck for example – when it’d be hard to hear a crowd cheering over the road noise – I sometimes can’t tell which version of YYZ I’m hearing until the drum solo either starts playing, or is missing. Something in the way she moves attracts me like no other lover. Something in the way she woos me; I don’t want to leave her now, you know I believe in how. 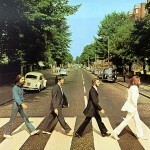 Abbey Road was the last album the Beatles worked on together (yes, Let It Be came out after that, but most of the work for that album was done before the Abbey Road sessions started). It was also one of the first cassette tapes I had, given to me by my aunt, and was most likely the first musical piece I would listen to in its entirety every time. This is another of the very few albums I can listen to without skipping over something. Two of George Harrison’s best Beatles-era compositions are here (Something, Here Comes The Sun) and who doesn’t love the climactic ending to the album, culminating in the line “And in the end, the love you take is equal to the love you make.” I listen to this album and wonder what might have happened if The Beatles either stuck together through their differences, or got back together after a break. Hell, if the Eagles can do it, I’m sure John could have made amends too. As I was walking down the street one day, a pretty lady came to me and said her diamond watch had stopped cold dead. 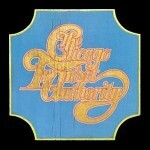 Chicago’s first album (and the band themselves) were actually called “The Chicago Transit Authority” until the CTA threatened to sue and forced a name change. After their debut album, they were just Chicago, but there was nothing “just Chicago” about the music or their 1969 double album. With tunes like “Beginnings” , “Questions 67 & 68” and their cover of The Spencer Davis Group’s “I’m A Man”, this record was packed with the fusion of rock & jazz that put Chicago on the map. What do I remember most about it? Ask anyone who’s heard me listening to the intro to “Does Anybody Really Know What Time It Is” (surprise, most people who hear this on the radio don’t know there’s a 1:15 intro to the song) and they’ll mention that I tap out an odd beat as the song plays. Those with a keen (or strange) ear may realize that my timing is almost exactly 33 1/3 BPM… corresponding to the scratch that went across my copy of this record, and was deepest in that track. I stand atop a spiral stair, an oracle confronts me there. He leads me on light years away through astral nights, galactic days. 2112 is an album that I didn’t get into until later on in my Rush loving days, but any time at a concert I heard the Overture (or thanks to Jerry Stiller, “A Passage To Bangkok”) I always tapped my feet and nodded my head. 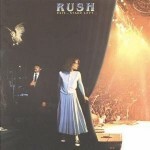 Not quite a concept album (only one song is named for the album, though that song takes up one side), this 1976 staple also lends its album artwork to the annuls of Rush history. In fact, if ever I were to get a tattoo, it would probably be of the red star. Interesting side note, when I was much younger I used to frequent a “talker”, which is like a MUD but without the dungeon. Its name was Cygnus (cygnus.rsabbs.com), the bulletin board that it was born from was Red Sector A, two of the admins were By-Tor and Snowdog, and another machine on their network was Syrinx. Then according to the man who showed his outstretched arm to space, he turned around and pointed, revealing all the human race. I shook my head and smiled a whisper, knowing all about the place. 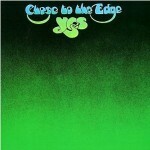 Close to the Edge was also included on other Yes albums that I had (between box sets and compilations) but there’s a separate reason this deserves a spot on the list. Shortly after high school, I rekindled a friendship with someone who had graduated a few years before, and he convinced me that South Street in Philly wasn’t a bad place to go (also showing me the easy way to get there over the high speed line, and walking from 8th & Market). One of the first stores as you travelled down South Street from that direction was called “Thrift For Aids”, a thrift store whose proceeds went towards AIDS-related charities. Their basement was a huge collection of vinyl, and I spent hours in there over various trips picking up as many records as I could carry, usually for around $.50 each. One of these trips was when I found a copy of Close to the Edge, and the jacket looked to be in good shape. When I took the album out of the sleeve, however, I almost fell over – it still had that “never been played” sheen on it, like a needle had never touched its surface let alone a fingerprint. 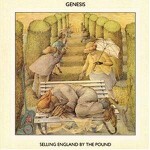 At $.50 this was a complete steal to me, and I gingerly played it on my turntable that evening. Something about the opening and closing nature sounds coming over the speakers from that turntable was relaxing; the opening because I knew what I was about to get into, and the closing because I’d just experienced the highs and lows of one of Yes’s wonderful multipart compositions. You can say the human heart is only make-believe, I am only fighting fire with fire. But you are still a victim of the accidents you leave, sure as I’m a victim of desire. This one goes back. Way back, to when I was a wee lad, sitting on the living room floor in front of the old stereo that my parents had and listening to music. At the time, the vinyl wasn’t kept nearby – probably safer that way, so it wouldn’t get damaged by a kid who loved to mess with stuff. But one thing was available, and that’s the 8-tracks. One of them stuck out in my mind, because I liked the music on it. Everything was upbeat and fun, and had a good melody to it. Lots of harmonizing, fun guitar rhythms, all around just a joy to hear. Years later, after I’d started listening to just the radio and then moved back into music on personal media of some sort, I found this album in a store and all those memories flooded back. Glass Houses has been a treasure to listen to ever since. Just a little deuce coupe with a flat head mill, but she’ll walk a Thunderbird like she’s standin’ still. She’s ported and relieved, and she’s stroked and bored, she’ll do a hundred and forty in the top end floored. 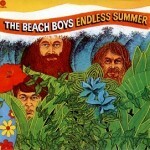 Another 8-track from that era was The Beach Boys’ Endless Summer. I actually don’t have a playable copy of this anymore, since after the 8-track I had it on cassette, but never owned the vinyl or a CD. And of course this comes to my attention now, as I’m looking for an image of the cover to put here and realized that “All Summer Long” is on this album and not in my collection! Of all the songs on there, it would figure that one that I don’t otherwise have would be the one to get stuck in my head. The harmonies of The Beach Boys were always with me growing up, between the music in our collection and an old concert which was on TV that my father recorded, and I just about killed the Beta tape on which it was saved playing it over and over. Yes, I said Beta. I only tossed my deck about 7 years ago, and I still regret having done it. This double-album compilation was released in 1974, and still holds most of their greatest hits today, though I think it’s easier to find “20 Good Vibrations”. Reality it seems was just a dream – she couldn’t get it on with the boys on the scene. But what do you expect from a chick who’s just sixteen? Another double LP (that’s not considered cheating, right? 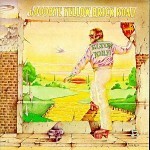 ), this one from Elton John and released in 1973, is considered his best-selling album. His seventh studio release, Goodbye Yellow Brick Road covers a lot of different styles of music, and flows nicely from one track to the next. I had of course heard the title track, as well as some of the others (Candle In The Wind, Bennie and the Jets, Saturday Night’s Alright For Fighting) on standard radio airplay, but another evening of WYSP’s habit of playing an album in its entirety is what made me realize I needed to have a copy of it for myself. It’s songs like the ones on here that make me want to learn how to play piano, even though it would probably take me ages to get anywhere near the sounds that he can make come from that instrument. I’m looking at myself, reflections of my mind, it’s just the kind of day to leave myself behind. So gently swaying through the fairyland of love, if you’ll just come with me you’ll see the beauty of Tuesday afternoon. The Moody Blues had a rather lofty goal: to mix orchestral music with rock and roll. Their second album, released in 1967, fit the bill quite nicely. In the case of this concept album, they wanted to put to vinyl an idea they’d worked on, that of a person passing through a normal day from dawn to twilight. The album almost never happened, as record executives didn’t like the idea, but the band kept on recording and released what has become a mainstay of rock music with an orchestral backing. This is another of the few albums that I can put on play and listen all the way through, and if the mood hits me right I can even sing along with it and remain in key. Combine that with how much fun it is to play some Moody Blues tunes on guitar, and this album is a smile just waiting for someone to press ‘play’. And if the cloud bursts thunder in your ear, you shout and noone seems to hear, and if the band you’re in starts playing different tunes, I’ll see you on the dark side of the moon. 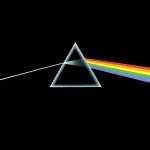 No list of albums would be complete without Pink Floyd’s 1973 opus which still ranks as the third highest selling album of all time. From the heartbeat opening the album to the same heartbeat closing it out (and Gerry O’Driscoll’s “There is no dark side of the moon, really. Matter of fact, it’s all dark.” line audible if you press your ears into the headphones and/or crank the volume loud enough to wake the dead if you were playing Time), there isn’t a clinker on the album. Soft, flowing piano melodies such as The Great Gig in the Sky, Gilmour’s wailing guitar on Time, the odd and catchy 7/8 time of Money, and the medly of Any Colour You Like, Brain Damage and Eclipse that closes out the album, every minute of this recording is a joy to listen to. So if everything under the sun is in tune, grab your headphones and a cold one, kick back, and enjoy The Dark Side of the Moon. This entry was posted on Wednesday, February 11th, 2009 at 15:35	and is filed under Music. You can follow any responses to this entry through the RSS 2.0 feed. You can leave a response, or trackback from your own site.